Open Innovation (OI) is an approach whereby organisations, originally companies but increasingly governments and NGOs, seek to collaborate with others to deliver innovation. Innovation is naturally a collaborative activity, but the practice really came to the attention of practitioners and academics when Henry Chesbrough coined the phrase ‘Open Innovation’ in 2003 in a book of the same name. He defined it as: the purposive inflows and outflows of knowledge to accelerate internal innovation, and expand the markets for external use of innovation, respectively. (Chesbrough, 2003). This theme could equally have been titled ‘Collaborative Innovation’, and we’ll be embracing best practice and learning from all manner of such activities. 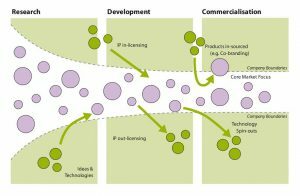 Open innovation has been described as adding a ‘permeable boundary’ between the organisation and the external environment. Information and knowledge flows into and out of the ‘innovation funnel’, as ideas are developed into products and services that are taken to market. [See figure]. This concept embraces numerous interaction types: the adoption of blue-skies research; licensing of mature Intellectual Property (IP); co-branding of mature products and spin-out of under-utilised technologies. The W-F-G-M model developed by Gene Slowinski (Slowinski, 2004) is perhaps the most widely adopted framework for OI. This sets out the four key stages in the life-cycle of collaboration: identifying what resources are Wanted; Finding potential external sources; Getting access to these resources; and Managing the relationship. OI has been widely adopted across many industrial sectors, with FMCG, pharma and computing being in the vanguard. Faster, better and cheaper are often cited as benefits. Amongst the highest profile adopters is P&G, with former CEO, AG Lafley, inspiring a change in culture from ‘not invented here’ to ‘proudly invented elsewhere.’ The thinking has converged into the not-for-profit sphere, as illustrated by the ‘open access malaria box’ project, which provides free and open access to 400 compounds with anti-malarial properties.